Have you lost your Lincoln car key? Is somebody stole your Lincoln car key? Have you broken your Lincoln car key? Losing your Lincoln car keys could be very frustrating, particularly when you are getting late out of work, or early morning. When you lose your car key, you feel helpless. You’re rolling your mind with questions, as well as trying to find the answers. In case you are trying to get your car to your Lincoln car dealership, he’ll charge you a great amount of money. For this reason, you should call us. Instead of wasting your time going to your Lincoln car dealership to get a new set of keys, contact LockTech24/7. We can help you replace your lost key in a fraction of price. We are proud to offer Lincoln locksmith services in the Lehigh Valley, PA.
LockTech24/7 has mobile locksmith services. Our technician arrives fast, cut and program your Lincoln key on the spot and without delay. In other words, leave you happy driving your car back on the road. Whether you lost your Lincoln key or broke it, we can help. LockTech24/7 Lincoln locksmiths can make a new key for your Lincoln, instantly. A new Lincoln key will replace your existing key, while your existing Lincoln key will no longer operate your car. Once your new Lincoln key is programmed, your old key will no longer work. It means, if somebody found your Lincoln key and wants to steal your car, he won’t be able to run your Lincoln car. Today, replacing Lincoln originated keys requires Ford diagnostic equipment to program a new key. A key that has a computer chip, which is a tiny radio transponder embedded in its plastic head. The key chip must be programmed and recognized, otherwise, it won’t start the car. If you have spare keys, all keys must be present on site. According to the VIN number of your car, we can find and get all the information we need. Our Lincoln locksmith service is ready for any emergency situation. Our technician’s vehicles are fully equipped and set-up for fast efficient on-site mobile automotive locksmith service. We focus on getting you back on the road as quickly as possible. If you have lost your car key, or someone stole it, we can get you back on the road in no time. Whether it is a basic key or transponder key, we can make it. Our expert technicians have been working with Lincoln keys and locks for many years. Transponders were first developed during World War II to allow radar recognition of allied planes. These days, transponder keys are still in use in aviation though they are mostly developed for use in automobiles. The majority of transponder keys to cars built after 1995, the chip inside a transponder key, disarms a vehicle immobilizer when the car key is used to start the engine. If you lock your key in your car or trunk and have no way of getting to it, a locksmith can often make an inexpensive key that will open the doors and the trunk only, but not start the engine. That will allow you to retrieve the original key. Have you broke the key inside the ignition? Is the ignition switch of your car jammed, and the key doesn’t turn it to ON position? The ignition switch, located on the steering column or in the dashboard, takes the power from the battery and directs it to all the accessories and electrical components of your car. It also transfers the power to the starter when you turn the ignition key. The lock cylinder in the ignition can fail. Drivers will know the lock cylinder fails if they find they cannot insert the key into the ignition or if the key refuses to turn the ignition switch. 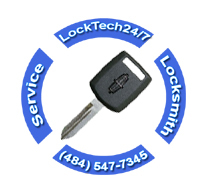 In these cases, LockTech24/7 can repair or replace the lock mechanism, helping the car owner avoid an extra cost trip by towing the car to the mechanic or dealership, or extra cost of labor.